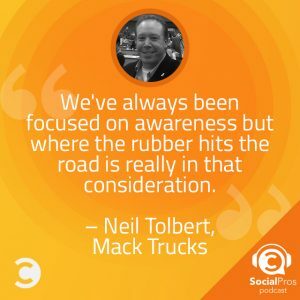 Neil Tolbert, Director of Marketing and Communications at Mack Trucks, joins the Social Pros Podcast to share how to successfully drive organic growth through consideration, content, and consistency. You don’t usually see “organic social growth” and “corporate B2B marketing” in the same sentence. However, Neil at Mack Trucks has managed to swell the social ranks of his corporate accounts, especially Facebook, with little to no paid ads. It’s almost all organic. 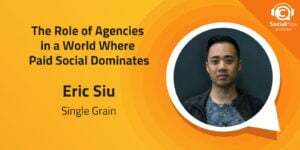 Through consistent content, a team organized by skillset, and deep mapping of touchpoints across all platforms he has built a social empire not often seen in the B2B world. Having his team setup by skills allows each member to contribute at their highest possible level, which leads to a consistently high quality content. Consumers that engage with Mack Trucks are rewarded with impressive content that pulls them in and drives them to consideration. By taking the time to map customer touchpoints thoroughly, he is able to follow the leads through their journey. This allows for further fine-tuning of content to turn those leads into sales. A truly rewarding social cycle for customers and businesses alike. There’s no such thing as doing too much. You can always be learning. One thing Neil has done differently with listening to podcasts and joining things online is keeping a notebook at his desk for notes as he listens. Having these notes to go back to has helped drive home some of the truly impactful learnings he’s picked up along the way. Elon Musk. Neil would be interested in hearing his vision on getting people to outer space and really interested in the Tesla production and all the things that are going on there. Jay: Welcome everybody to Social Pros, the podcast for real people doing real work in social media. I am as always Jay Baer, founder of Convince and Convert, joined as always by my special Texas friend. 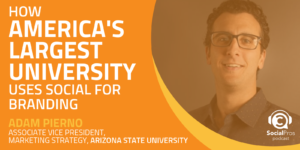 He is the executive strategist for Salesforce Marketing Cloud. He is Mr. Adam Brown. Adam, how are you my friend? Adam: Jay, I am great. A question for you, were your ears burning this weekend? Jay: No, but my heart was burning this weekend as my son's high school hockey team The Mighty Bloomington Blades dropped a pair of games with me in the scorer's box. It was an unfortunate set of hockey, but my ears were not burning. Were you talking about me? Adam: I heard someone ask about you. I was at an event this past weekend with some customer care folks and they asked about you and your book and all the customer care activities that you have been leading and talking about. It was very nice to meet some of our listeners and some people who just knew the Mr. Jay Baer that I know and love and respect. Jay: I love it. That's very nice to hear. It's always great to have some positive comments out there even all this long time, episode 289 of Social Pros. You know what's crazy about episode 289, this very episode, Adam? It's a trivia question. This is the first time, long time listeners, in the entire history of the show, which is almost seven years, we are within 45 or 60 days of our seven year anniversary, the only time on this program we have had a corporate guest back for a second show. Adam: Well, that says something about our guest. Jay: It does. We are joined again, again by Neil Tolbert, who is the director of marketing communications for Mack Trucks. Neil, welcome back to Social Pros, brother. Neil: Wow. Thanks, Jay. Thanks, Adam. Excited to be here. Jay: That's going to be the second line of your obituary, right? Director of marketing communications, Mack Trucks. Jay: Only two time corporate guest on Social Pros. Neil: That's awesome. That's amazing. Neil: That is big news. Thank you guys very much. Adam: We're excited to have you back. Jay: Look, here's the thing, here's why I want you back on the show, I'm not trying to speak out of school here, but on the surface, people who don't know you don't know your work, don't know your company. If you just say, "Hey, what does Neil do?" He does digital for Mack Trucks. People would think, "How interesting could that be," but you are continuing to do super interesting award-winning work on the content side and the social side. Really innovative stuff. I wanted to have you come back in and tell us some of your new stories because I think it really demonstrates that it's not about the company you're in, it's about whether you can hold that company to an accountable standard from an innovation perspective. You certainly have been able to do that. Neil: I appreciate those compliments, but is the team I surround myself with. It's a small team. I may have said it the last time, but we always say we're a big brand with a small team. When people hear that there's only four of us here running social and marketing for Mack, myself and three others, they're like, "Oh wow." I think they expect a big team and it's not the case. We pride ourselves in the work and it's just a good time. It's just so much fun. Jay: How do you deploy that team? Do you have your folks owning a particular channel? One person's kind of got Facebook and Instagram and somebody else has got Twitter and LinkedIn, or is it by sort of skillsets? Somebody's more writing. Somebody's more videos. Somebody's more analytics. How do you deploy your resources? Neil: It's by skillset. We have a gentleman named Jim McNamara who runs all of our writing, content. He edits Bulldog Magazine, which, a little interesting trivia fact, is the oldest running corporate magazine. First issue was in 1920 I want to say. Jay: How long have trucks been along? How long had trucks been around before that mag ... I mean for real like giant trucks like you guys have couldn't have been even in the market that long before that magazine was published. Neil: 1900 was the first Mack Truck. 20 years in the company started a corporate magazine and it's been running ever since. Jay: That's like baseball card times, right? 1920. That's like you get a Ty Cobb card and a pack of chewing tobacco with your Mack Trucks magazine. I mean that is old days. It's amazing. Neil: Yeah. That is amazing. Then we have Mark Urmos who does our video. Super talented guy, but we are able to do all of our video editing concept and story boarding, which is one of the most enjoyable things of my job. I love when we all get into what we call our marketing lab and just start pitching ideas ins whiteboarding thoughts and how we can tell some of the stories that we're trying to tell. Then over the last couple of years, Lauren McGuirk, she's done a great job at running social now. She and I and Mark, I mean we all kind of bounce it around, but day to day, in and out Lauren is the one that does most all the posting and does an excellent job with social for us. Jay: You have grown your Facebook audience from 6,000 fans to 170,000 fans. Jay: How did you do that? Was that having great content that get shared and that picks up new fans? Is it paid ads to acquire new likes? Was it promoting the Facebook page inside the magazine or inside the blog or on the web? Was it emailing customers? How did you acquire such a huge base of fans on Facebook? Neil: For one, we've never run any paid like acquisition campaigns or anything like that. We do do some paid sponsor posts just to get more eyes and visibility. We pride ourselves on the fact that the channel growth across all of our social has been as organic as we could possible make it and we do promote it across channels from within Bulldog Magazine, in the paid trade press and print that we run. For me, I just think it comes down to content and has been consistent over the last four years with the content that we do put out trying to make it interesting, trying to tell these stories around the customers and the trucks and just get everyone involved in what we're doing here at Mack. Jay: Is Facebook really the core social network for Mack? Is that the place where most of your fans are aggregated or are you seeing traction in some of the other social channels whether it's Twitter, Instagram, LinkedIn, et cetera? Neil: It's by far the largest audience. We got up to 170,000 through the launch of the new truck. Twitter is still that really ... There's just good dialog. It's a great community of truckers and drivers and a lot of interaction. We have fun on Twitter. Lots of pictures get shared. Then on Instagram, that channel, which we started from that zero maybe two years ago, is up to 36,000 followers there. That's really just about sharing pictures of trucks. People always want to see the new trucks, the old trucks. We do see a lot of really good engagement around Instagram. Jay: Are those pictures that your team takes or are they pictures from fans or customers who are out of the field? Neil: Yeah. They're pictures that we take. They're pictures of customers as we go out and see them and do customer success stories and things like that. We'll snap photos. There are also photos that gets sent into us across social. People just sharing. Wow. That's really cool. We'll share that out. We do that as often as we can with the images that we get. Jay: You just launched a brand new truck called Anthem, which is a huge initiative for the company, right? Reimagining what a highway truck can be. I imagine that you and your team were working on content and social assets for that for a long, long time. Can you talk a little bit about the editorial calendar and the time horizon and the planning that goes into a major, major corporate roll out like that? Neil: Yes. This is the first major highway truck that Mack's released in 18 years. It's long overdue. It's not like an automotive where you see new model releases every three to four years. This truck from an engineering standpoint was probably in the works four to six years. From a marketing standpoint, we certainly took a lot of time and put a lot of thought into how we wanted to market and launch the new Anthem. We really set out to produce a truly cross channel experience from print to digital to social to even somethings that we did on the ground in Allentown the week and day of the launch. Jay: That's sort of documenting the actual big launch on the day of the launch in social with content. Okay. Neil, one of the things that you have told me in the past is that there's a big initiative at Mack to tie marketing back to the sales funnel to make sure that the efforts of you and your colleagues are actually producing net present value for the organization. How do you do that in social? I mean obviously if you're going to buy a Mack Truck, that's not something you're going to do every 30 days. You know, long sales cycle, big expensive purchase. What kind of metrics do you use to say, "Hey, what we're doing in Facebook or YouTube is actually working. There's a contribution to outcomes there." Neil: We recently went through just a very long exercise where we identified every touchpoint that we have across content from a marketing communications perspective. That's inclusive of print, digital, social, the whole nine yards. Prior to that, we kind of vetted out and finally put the nails in the coffin so to speak on identifying what our sales funnel is with sales and just how we all looked at it and how we communicate each stage of the sales funnel. Once that was vetted, we then again just really started mapping out all the touchpoints that we have and identifying does this contribute to awareness, does this contribute to consideration and then does it contribute to interest to actually a valid sales lead. We're really tasked to getting that person or that activity to drive consideration. Jay: How does that consideration manifest itself? Is that coming to the website and doing something where they express interest and fill out a lead form or something along those lines? Is it more of an offline, you walk into a dealership or call a sales rep? How do you sort of track that last piece that really matters? Neil: From us, it is mostly digital because that is what we can track in social. It is a brochure download. It is joining an online webinar. It is filling out a form. It's clicking through. Basically for us what the exercise kind of vetted out was we've always been kind of focused on awareness, the impressions. At the end of the day, that's a really big number and we would spend a lot of time chasing down those metrics. I don't want to say it doesn't matter because it does matter, but where the rubber hits the road is really in that consideration. It's really seeing those people take that next step and express interest in Mack and engage with us either from clicking through to watch a video or clicking to download a brochure or content that we put out across the web and our social channels. Jay: I imagine a lot of your customers are already aware of you. It's not like, "Wait. Mack Trucks? Never heard of that," right? If you're in the market at all, it's a brand that's 100% recognizable. They may not know the new model or some of the attributes, but they probably know the brand. It'd make a lot of sense then to track some downstream behaviors. Last one for me before I turn it over to Adam, you have said that you're doing more and more customer service in social, which I find really interesting. How is that playing out? Is it people trying to get a hold of the brand on Twitter or leaving comments on Facebook or some other mechanism? It's just fascinating to me that even in a business like yours, you're starting to see more social media customer service. Neil: It's both. It's good and bad and what I mean by that is like your book "Hug Your Haters." They're not hating at us, but what we're seeing people reach in is where maybe things have fallen down at the dealership level. They'll come in to us through our Facebook channel is where we've seen a lot of people reaching in and just saying, "Hey, I'm trying to get something done or I haven't heard back from someone. Can you guys help me out?" Then we're taking those messages and putting those back out to district service managers and folks and just being responsive to let them know, "Hey, this isn't the norm. We'll find out what's going on and we'll be able to help you." We're seeing quite a bit of that start to come through social to where in the years past, probably even the last time you and I chatted, that wasn't the case. It's really interesting. I'm not real sure what swung the pendulum there, but nonetheless I think the fact that we respond and that we're getting these folks help and taken care of, perhaps that channel will just continue to evolve and develop as we move forward. Adam: Neil, I think that's such an interesting kind of concept and this overall discussion I'm loving because as Jay said at the open, here we are in episode 281 and you're the first corporate guest that we've had on twice. We had you on the show almost two years ago, December of 2015. 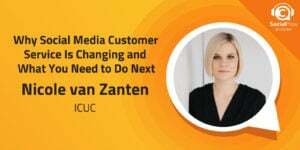 As it relates to social customer care, as it relates to sales, lead generation and some of these other things, we've seen a tremendous evolution in the marketplace in this space. I want to take what you just said about customer care even a little bit further. You're saying yes, you're hearing a lot of things from your customers when they had great and maybe some challenging experiences at the dealer network. You as the Mack Trucks brand are responsible for responding on behalf of the brand and getting those people some sort of answer. I'm curious from an automation standpoint, from a technical standpoint, when you're throwing something back over the fence to the dealer network, to a technical service advisor, to a district manager, how are you actually kind of going through that? Is it sending them an email and saying, "Hey, we got this social post." Do you have a program? Do you go back into your CRM system and kind of place the query or the question there? How are you kind of making sure that those questions are getting responses from an overall enterprise standpoint? Neil: At the enterprise level, we're able to do that on the lead gen side. We do have a mechanism for getting leads out to the dealer network and us being able to see that those folks are followed up and worked on. We're in the process of rolling that out and completing that. It should be finished by the end of this year to all of our dealers. It's about 380 nationwide and in Canada. On the customer service side, we don't have all those people connected in to a platform at this point to where we could channel those customer service issues that come up. It's a bit unfortunately emailing back and forth. On our side we do use SRM, and we're able to assign some of those questions to product managers internally. If it's product questions and things like that that come up, we are able to listen for mentions of product and get that to the right product manager. We feel like we've made great strides in how we handle social and disseminate social in that regard. As I mentioned just from a customer support, we're not linked up like we need to be across the enterprise yet. We're working toward that. Today it falls in email and a little bit of back and forth. Adam: Neil, I'm curious, as you said, I'm going to expect that because of this evolution of social that you've led there at Mack Trucks over the past two years, you're seeing a larger embracing of social. Without a doubt it appears your customer service and your salespeople and your senior leadership understand the value of social, but I'm curious if the types of challenges and opportunities that you have now are different than the ones you had two years ago. Is there a bigger push to show demonstrable ROI? Do you have a bigger challenge in getting resources and money and headcount that maybe you are getting two years ago because of those higher expectations? I'm just curious how you are approaching social differently maybe than just in December of 2015, the last time we spoke? Neil: No. If anything, Adam, for us, it's easier because we have proven it out. Social played a huge role in the launch of the new Anthem Truck last month. We saw incredible results and I think it just really got the organization super excited about the role that the launch had across social from the tease and the videos that we put together, to us live streaming the event. That night we had people back here on campus in Greensboro that weren't able to attend the launch event in person. We kind of had the party and got the employees together and they rallied around being able to watch it. None of that would be possible without social. If nothing else, it's easier. Our budgets are the same. We're doing this work within same budgets that we've been working with for the last four years. I would say that it's just gotten easier over time just because of the exposure and the activity that we've been able to share internally and that now that people are just paying attention to what's going on and they see the value. Adam: One thing you shared with us is the increase in your number of followers and the engagement of those followers over the past couple of years. You mentioned Facebook. You mentioned Instagram and a couple of the other platforms. I'm curious, Neil, kind of what you attribute that to? Is it hey, we have more of our customer base that is on social than they were two years ago or we've had a slightly different kind of content strategy, that we're using more visuals, more storytelling, more video like you said one of your four team members focus 100% on video? As you look at it and as you kind of think about what our listeners are doing kind of in similar situations, can you choose one or two things that you think are responsible for the growth of social and followers that you've seen over the past two years? Neil: If I had to pick, I would say that it is the storytelling around the content that we've produced over the last two to three years. Trying to highlight from customer success stories to utilizing the product, to some of the VR work that we've done and shared those stories out. We utilized a couple of influencers during the launch of the Anthem and that turned out to work incredibly well for us. Just being able to surface all those stories across our social platforms I think is results in the growth that we've seen in the engagement. Adam: When you look at your number of followers as they increase, are you able to segment them in any way? For example, hey, here are some followers who are followers of Mack Truck. Because maybe they're retired drivers or they're just enthusiasts about the equipment, but they're probably not buyers. Then you have your kind of owner/operators who maybe own one or two trucks and could not only be your existing customers, but prospective customers. Then you have the fleet buyers, the people who buy new Mack Trucks by the dozen. They're arming an entire fleet of vehicles for their operation. Do you have any ability to kind of start to slice and dice your followers and determine which of these are certainly fans and evangelists of the brand, but which of these could actually impact by millions of dollars sales? Neil: Yeah, absolutely. We do that by taking that ... Getting them to respond to those campaigns whether it's a campaign that they saw across social or wherever it might be. Those are questions that we ask as we progressively profile who that person is. We're seeking to learn more about them. Typically, a lot of ways other companies may work. When you register for a webinar to learn more, to be able to talk to one-on-one with one of our product managers and ask him questions. We're asking for fleet size and job roll and we are running some lead scoring against those profiles to be able to build and identify those segments and who it is that's engaging with us. Jay: Neil, when I come back and ask you a couple questions that we've asked every single guest on this show including you two years, so we'll see how much your answers have changed in that amount of time, but want to remind you of the friends who make Social Pros possible. Of course, our pals at Salesforce Marketing Cloud and their new eBook I've been telling you about called "More than Marketing: Exploring the 5 Role of the New Marketer," which breaks down the five new essential skills that all of us need to have in order to continue to be employed and do the great things that Neil and others who have been on the show were doing in their organizations. There's interviews in here. There's stories. There's interactive features even in this eBook, which is pretty spectacular. All kinds of immediately actionable steps that allow you to master, master your new talents. Go to candc.ly/newmarketer. That's canad.ly/newmarketer. 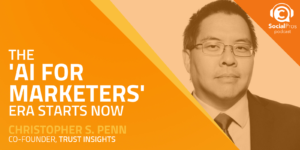 That's "More than Marketing: Exploring the 5 Role of the New Marketer" from Salesforce Marketing Cloud. Also, Adam, you may remember, we launched a brand new show here in the Convince and Convince Podcast Network. We had the host of the new show on last week's episode, Joey Coleman and Dan Gingiss. Actually Joey Coleman was on the show. We talked about Dan Gingiss. He wasn't on the podcast, but we talked around him. It's called The Experience This! Show, which is a really interesting podcast. Lots of different kind of style of episodes and they do different segments in each show. It's really interactive too. You can call into the show and things too. That's pretty great. Go to wherever you get your podcasts and look for Experience This! If you like customer experience and you like stories about companies doing customer experience well, that's the podcast for you. You can find it on iTunes or wherever you get your podcast. Look for Experience This! or just go to experiencethisshow.com. Experiencethisshow.com. I think you're going to love it. Adam, back to you. Adam: Jay, thank you. Neil Tolbert, director of marketing communications for Mack Trucks. So great to have you on the show the second time. Neil, one of the things that you shared with us is kind of book ending these past two years is the fact that so many of your dealer network now are armed with iPads. They have proprietary apps that you and your team and the other IT and technology teams, sales teams at Mack Trucks have created. Curious kind of how social fits into that equation now that the dealers themselves are armed with technology. Are you at the same time arming them with any either social insights or giving them the opportunity to respond in social or is this something that you've decide you kind of want to keep at center or if you've decided on a protocol or a phase process for doing anything like that? Neil: Well, one thing we have done when we launched the truck was we built a resource hub that does connect into our Eloquii, Instant Send. We published all of our videos. We're aggregating all of our social channels and all of our social posts into a resource hub where the sales guys can easily share that from their iPads. Instead of them having to hunt, we organize it, we pull it all in and they know where to go to find it. If they're working, back to your question Adam about segment, it could be a construction guy. We got new interiors in the granite dump trucks. All that content is segmented and easy for them to find all in one place. At the click of a button, they can promote that. They can like it or share it out on their social channels. That's been something we're excited about that's a recent addition to how we've been doing things. 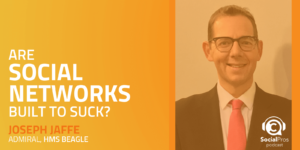 Adam: I'm going to assume that as you've gotten so much more successful in the social arena and that you evolved the Mack Truck brand for this kind of digital transformation, your competitors have probably done much the same thing. I'm curious, Neil, if how you kind of approach and look at your competitors. Are you tracking what they're doing in the social media space? Are you seeing if they're doing paid media versus organic media activities? I'm just really curious kind of specifically what you look at and how you kind of rate or score yourself. I'm not asking you to score, but I'm curious what the metrics are for you to be able to say, "Hey, look, okay. These guys are doing this thing. I think we're doing better here. That's something that we might be able to improve on." What are those metrics that you look at? Neil: What I really like to keep an eye on is just overall share of voice across the brands, from Mack to our competitors. I have listen topics set up, and they listen for a lot of our trade press, direct websites, their social channels. Month by month and almost week by week basis we check in just to look for spikes and conversation and see how we compare and what's going on. We do like to keep an eye on things. At the end of month, we pride ourselves on how we ranked, share our voice across the trucking industry. That's where we strive to go is to be number one and we've done that many out of the last 24 months. We're proud of the accomplishment. Jay: You should be. It's pretty spectacular stuff. Make sure, ladies and gentlemen, you go to macktrucks.com. Follow them on Facebook. See what Neil and his team are doing on Instagram and Twitter as well. Neil, we're going to ask you the two questions that we ask everybody on the show. You know what these questions because you already answered them 22 months ago, but I'm fascinated to see what you say this time. I don't know if you've looked back to see what you said before, but I did, so I know what you said before. First question is what one tip would you give somebody who's looking to become a social pro? Neil: One tip. This one I don't think has changed. I don't think that there's enough that you can do. You're always learning. I still consume a lot of podcast. One thing I have done different with even listening to podcast and joining things online is just now I'll keep a notebook on my desk. When I'm not in a meeting and I'm able to sit there and work and listen to a podcast, you get caught up on things. I'll just make notes. Before I would listen a lot in the car and still do, but while you're driving down the road, you may hear something that you want to take away from a podcast, but by the time you get to the office and walk in the door and get busy, you've long since forgot all about it. Now I just make notes and I'll go back. It could even be products or people that are doing great things in other organizations. Just things that you pick up. I've enjoyed being able to go back to those notes. Jay: We should make some Social Pros branded Post-It notes with our friends at 3M and make those available to listeners. Maybe we'll work on that for the holiday season. That's a great idea. Last question for you Neil Tolbert, head of marketing communications Mack Trucks, if you could do a Skype call with any living person, who would it be and why? Neil: This time around I would say Elon Musk. I've just been following the guy. I don't know if how many people on your show have opted to chat with him, but I would be interested in his vision on getting people to space and really interested in the Tesla production and things that are going on. There's been some recent headlines there. Jay: He's talked about doing a truck, right? Neil: He's talked about doing a truck. Yes. It could be very disruptive. Jay: Possibly a joint venture maybe. Neil: I don't know. I think they'll do their own thing. We have our technologies that we work on here as well, but just I think it'd be interesting to have a conversation with him. Jay: Yeah. No question about it. Enough people have mentioned Elon Musk in that part of the show that we need to try and work on getting him on the show, Adam. Jay: Okay. Surely Marc Benioff, who runs your company, Adam, knows Elon Musk. I'm certain of that since Mr. Benioff knows all the Illuminati. I presume that you could make that happen. Just send an email. Adam: I will see what I can do. Jay: That's it. That's your assignment. I love it. Neil, thank you so much for being back on the program. Delighted to have you back on Social Pros to tell us how things have been progressing at Mack. I think it's so fascinating what you said that it's actually gotten easier for you not harder because you've got more internal support. I think there's a real lesson there for everybody that once you sort of get all the folks in the organization believing in the power of social, everybody's job gets a lot simpler. Congratulations on the great work. Neil: Oh, thank you and thanks to you both for having me back on. It's a real honor to do round number two. Jay: Delighted to do it. Next week we talked a little bit to Neil about Instagram. Next week we're going to go deep into Instagram.